The Rich Forks is an audacious project by Melbourne artist/activist V-T-R (Van T Rudd). Summarised as “swiping luxury dinnerforks from the 1% and displaying them to the public,” the intention is to allow some of the most underpaid people in society – hospitality workers – to quietly subvert the power of the wealthiest. Forks used by British royal Prince Harry, Democratic party presidential candidate Hillary Clinton, media mogul Rupert Murdoch, Australia’s formerly-richest person Gina Rinehart, and billionaire-from-birth James Packer, have been collected for public display – saliva, food remnants and all. The first exhibition will be held in Melbourne next month ahead of a planned world tour. V-T-R said The Rich Forks was about “taking something back” and “re-appropriating a tiny piece of the vast amount of wealth stolen from us” through Global Financial Crisis bailouts. “A vast number of hotel workers are bending over backwards serving this class of people day-in, day-out around the world as the extremely wealthy attend exclusive corporate dinners and forums,” he said on Facebook. 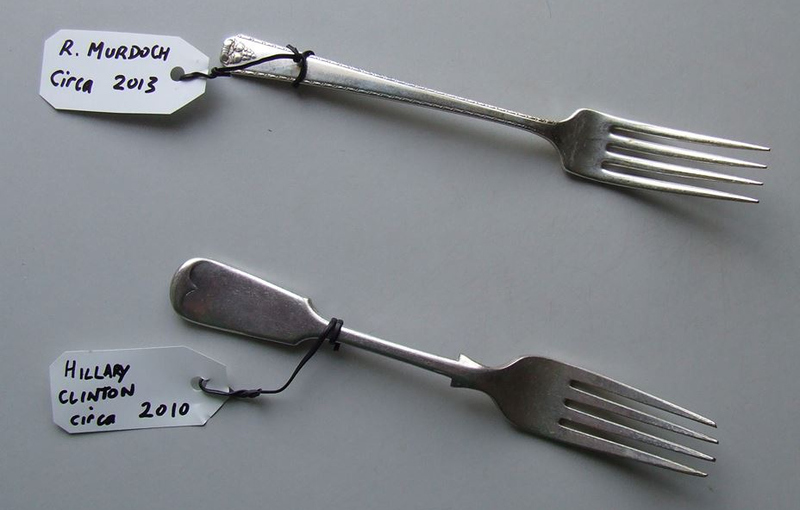 “Luxury dinner forks have been swiped (or ‘di-Looted’) over a 15 year period from five star hotels [around] the world, complete with the saliva and food stains of their users, and will be displayed in public/community spaces locally and around the world in the coming years. 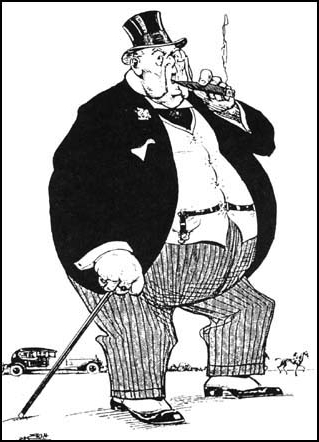 “The Subsidised Mineowner – Poor Beggar!” – unknown artist. Published in the September 1925 Trade Union Unity Magazine. While V-T-R is known for art, that is not the focus of the exhibition. “That is of no real concern here,” he wrote. “Perhaps the best way to view them are as artefacts appropriated from the cultural behaviour of the extremely wealthy. A counter-example would be the British empire looting artefacts from the Aboriginal people of Australia over the last 200 years, then displaying them in Museums. This is state-sponsored plundering. V-T-R mentioned “di-Looting” again while responding to concerns about the legality of the project. “This is a preferred definition over ‘stealing,'” he said. “Why? Banks around the world appropriated trillions of public money after the Global Financial Crisis to fill their own pockets. Did they ask us for permission? “Rupert Murdoch’s company News [Corporation] received $880 million from the Australian tax office in 2014 due to some kind of business restructure in the past. Who’s committing legalised crime here? While who smuggled the forks out of major venue kitchens is undisclosed, the idea for the exhibition came to V-T-R 16 years ago while serving then-Australian foreign minister Alexander Downer at the Grand Hyatt Hotel. If you would like to see the unwashed forks of those fed with silver spoons, the first exhibition will be held at the Footscray Community Arts Centre from 5 May until 21 May as part of a wider May Day celebration. V-T-R has long sought to raise awareness of society’s great inequalities. One more recent example was his contribution to the public housing-themed 2015 Big West Festival, for which he placed a life-size sculpture of sleeping homeless man next to public toilets in Footscray. You can find out more about the event and public participation at the project’s Facebook page. Top image: The Rich Forks on Facebook.